I love to meal plan, but I think I’m in the minority on that one. And most of the time I enjoy strolling through the store loading my cart with groceries for the week. But, since most people consider these time-consuming, unfun chores, a handful of new companies have found a market: they’ll deliver a box to your door with everything you need to make a meal. Or several meals. Virtually all the measuring is done, you just have to do a little chopping and cooking and dinner’s on the table. Voila! I recently signed up for discount offers to trial three of these services: Blue Apron, Plated, and my local option, ACME Farms + Kitchen. 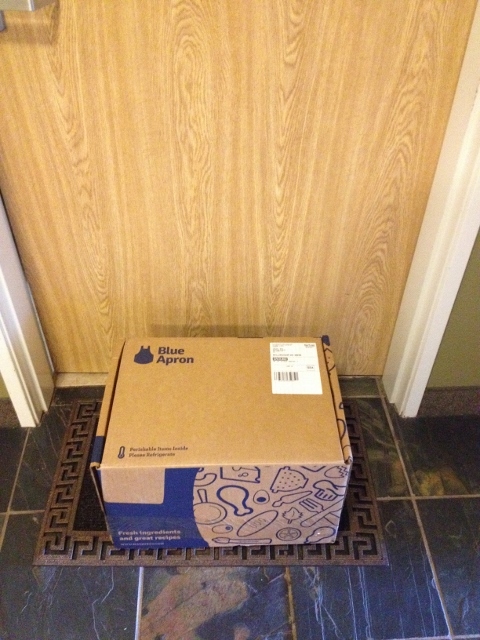 Today I’m talking about my experience with Blue Apron, but watch for posts on the other two options to follow. 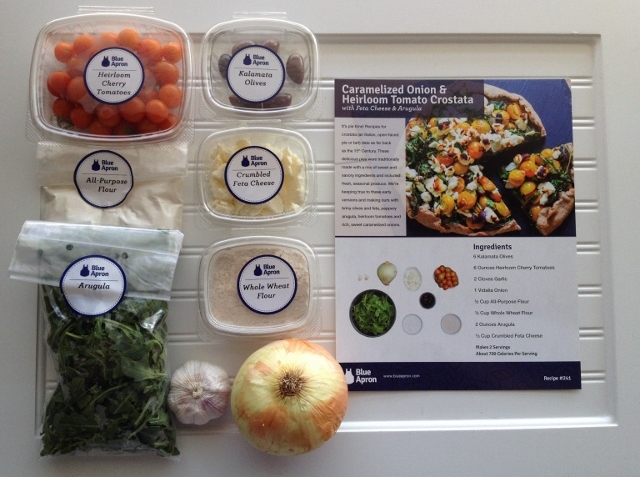 How it works: Blue Apron is a once-a-week subscription service that provides recipes and ingredients to make 3 meals for the number of people you specify; for us that’s 2. The delivery day is the same each week, based on your location. You choose your meal type (vegetarian in our case) and food preferences on their website and sit back and wait for your insulated 16 lb. package to arrive. What it costs: Let’s talk about this right up front. Meals are $9.99 per person, so for our box of 3 meals it was $60. My first week included two free meals as the special deal, so it cost $39.96. Delivery is free. The price is a little steep, but you are paying for convenience. Guess it depends how much your time and aggravation in the grocery line are worth to you. It might be doable for our small family twice a month, but I can’t imagine paying to feed a family of 5 or 6 this way. How hard was it to cook? Not that hard. We primarily rolled out dough, boiled grains and potatoes, tossed salad, and sautéed vegetables. 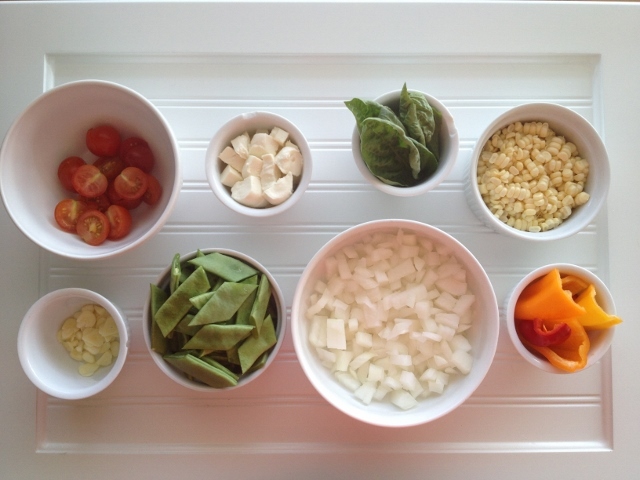 You provide salt, pepper, olive oil, basic cookware, and a chef’s knife. They note that their average cook time is 35 minutes, and I’d say that was pretty accurate for us. If Rachel Ray’s success is any indication, that amount of time works for most families. 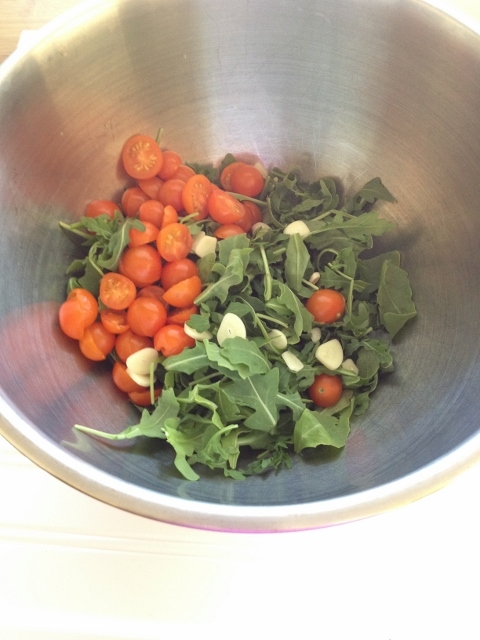 Arugula, garlic and tomatoes getting ready to be a crostata filling. How does it stack up nutritionally? Pretty good compared to the Standard American Diet (salty, fatty, meat and potatoes fare with few veggies and fruit, a.k.a. the SAD diet), but there’s room for improvement. Blue Apron claims each “healthy” entrée is within a range of 500-700 calories which is reasonable, but I wish they provided more details like fiber and sodium content. The main thing I noticed for these vegetarian meals was a lack of concentrated plant-based protein sources. Of course there is protein in grains and veggies, and some recipes had nuts, yogurt or cheese, but legumes, seeds, tofu, and tempeh were nowhere to be seen. 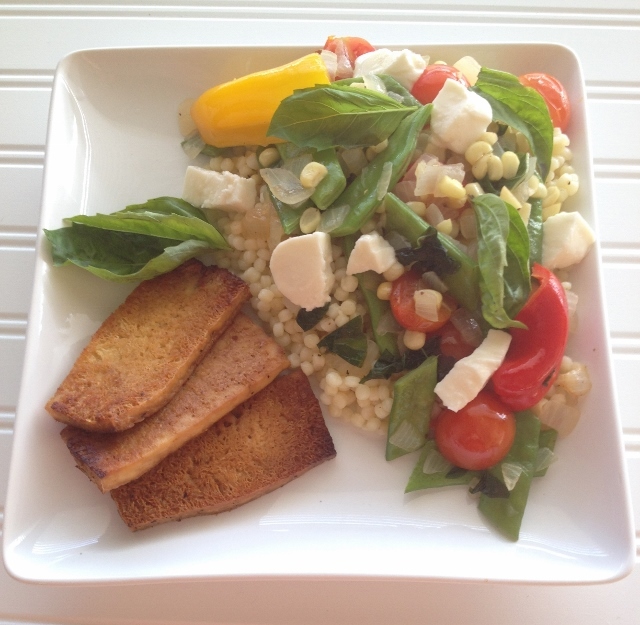 We served the Summer Sauté with our own baked tofu to boost the protein. Also, I was instructed to add a lot of olive oil throughout the recipes, anywhere from 1/2 tablespoon to 4 1/2 tablespoons total. I measured, of course, but if someone decided to wing it instead, they could inadvertently bump up the calories pretty high; healthy fat calories, but still calories. It was sort of hit and miss for whole grains. The crostata crust called for half whole wheat flour and half all-purpose flour, and one recipe included quinoa which is a whole grain, but the other grains provided were refined. On the plus side, vegetables were front and center in every meal. 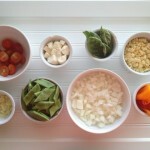 Summer Sauté ingredients ready to go. How did it taste? It varied. The Potato Rosti meal was by far the best. It was a fantastic mix of flavors, textures and temperatures. The Summer Vegetable Salad would be the runner-up. It had great crunch from the root veggies and the sweetness from the figs, which paired well with the sherry-shallot vinaigrette. The Borscht was our least favorite, even though we’re big beet fans, and the rest of the meals fell somewhere in the middle. 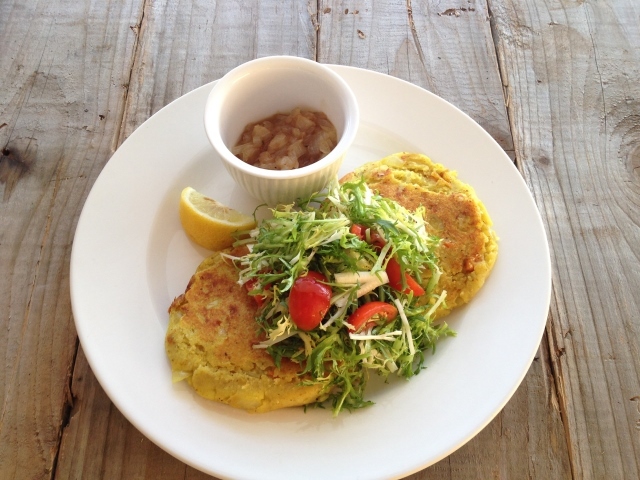 This was so delicious: Potato Rosti with Frisée Salad and Tamarind Chutney. Was there enough to eat? Yes. Supposedly we were preparing recipes to feed 2 people. Pretty consistently, though, it seemed more suited to 3 servings. And while they call it a “meal”, it was generally one dish. So, we often added sides for nutritional balance and a little variety on the plate, like fruit salad, bread, or a faux meat product. You can skip a week. If you’re going on vacation, or want to fix a week of familiar family favorites, just log on and tell them you’ll wait until the next one. They give you big, colorful recipe cards. It’s nice to see what the finished product should look like, along with pictures of the major how tos. Everything we needed to make Caramelized Onion and Heirloom Tomato Crostata. Every ingredient is labeled. I gotta say, this type of organization is awfully satisfying. I mean, just look at the little stickers! They use long-lasting ice packs. My box originated in Sacramento on a Tuesday, but when it arrived at my door in Bellingham, WA at 2:30 in the afternoon on Wednesday, the ice packs were still frozen and my ingredients were chilled. They got me to eat radishes. I’ve never been a fan, but I decided to go ahead and use them in the Summer Vegetable Salad as directed and I was pleasantly surprised. I learned a fast, basic recipe technique that I’ll reuse. The combination of grain + sautéed seasonal veggies + sauce sure is handy and easy to pull together depending on what’s in the fridge and pantry. I can make my favorite again. Those Potato Rosti will definitely be on our plates sometime soon. Now that I have the recipe, I can just get the ingredients myself. This service could work for vegans. Two of the meals we got were vegan and 2 could be easily modified to be vegan, but cheese would likely be unwelcome in the box, even if you weren’t going to use it. It might be a “food preference” you can specify when you set up your account. The finished dishes are beautiful. Someone clearly put thought into the visual appeal of these recipes. They turned out looking much better than the standard fare at our house. The carbon footprint for this service is pretty lousy, at least from my perspective. They used lots of packaging to ship groceries to my state from California, and then my box was driven up from Seattle. The folks at Blue Apron source local ingredients whenever possible, which is fantastic, but that means local to them, not to me. This is why I’m excited to write about my Bellingham company that’s providing the same service. Pretty sure it will be a similar list of pros, without this con. There was only 1 serving of leftovers for each recipe. (If we’d followed the portions as intended there would’ve been none.) When we cook for ourselves normally, we always have leftovers. We rely on them for lunches the next day, which also makes the cost of groceries more reasonable. Lots of steps were listed together. The instructions for each recipe are consolidated into 6 steps, but that means each one has several sub-steps listed, all in a single paragraph. This made it easy to miss things if I didn’t read very carefully. Overall, I’d say the experience was a good one. We got to try some new dishes and I freed up some hours in my week that would’ve been spent planning and shopping. That was noticeable and appreciated. 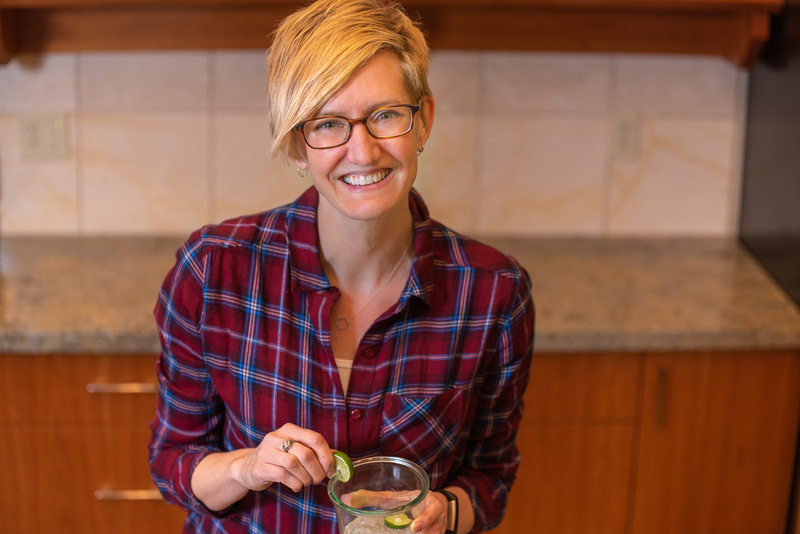 Just like with other tasks we face each day, someone’s found a way to streamline the dinner process, but that doesn’t have to mean sacrificing health or nourishment in the way that processed and fast foods can. These dinner kit companies provide real, whole foods that are cooked in a home kitchen that offer good nutrition and fresh flavor. If that helps someone skip a few steps and get dinner on the table for their family, I’m all for it. 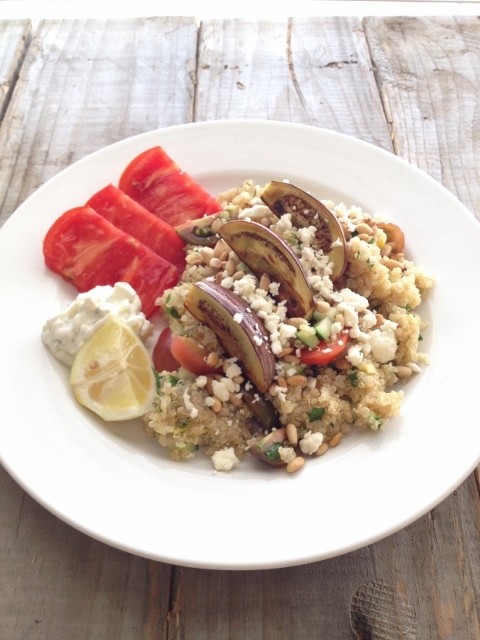 In the meantime, I’ll keep trying to convince non-dietitians that meal planning is fun! Does this kind of service appeal to you, your schedule and your taste buds? Kristine, I hope you also come on an adventure with PeachDish. We have recently introduced Vegetarian Options. Our Vegitarian chef Robert also has a vegetarian Sherrywood Supper Club. Hi Hadi. Thanks for stopping by the site. I will most definitely check out PeachDish! I just finished reading your article and it was a good read. I’m not a cook and honestly, I’m all about convenience and quality (aka) yummy without creating a dish, even with having all the ingredients provided. I decided to try Home Bistro and it’s been a winner with me! It’s a great choice for those like me who are either not interested in cooking, but wanting creative meals or those who just don’t have time to prepare a meal. Hi Olivia. Thanks so much for your suggestion. There are so many of these companies now! I’ll definitely add Home Bistro to my “must try” list. My husband and I have had this for three weeks. We love the food and are happy with the freshness and prep times. However, three of our entrees, at least, have shown the total calories divisible by THREE. We have the two person plan. For example, the grinders, which had TWO rolls, were stated at having 575 calories per serving, but that was actually if you divided the two rolls by three. Tonight, even worse, the chicken wings are 700 cal/serving for 3 servings in our 2 person box! Hi Jenni. That’s very interesting, and something to watch out for. I feel like most people would assume the nutrition facts were for two servings. I’m anxious for my first delivery. Beans & rice or vegetarian chili gets pretty tiresome. This will be a great way for me to delve into creative vegetarian cooking. I hate spending $30 for spices for one recipe and ultimately tossing out tons of food when only 1 stalk of celery is and 1 carrot is required. I’m hopeful this will be a perfect solution for me. I wish they had a “one person” option, though. Hi Jane. How exciting to get your first box. I hope it meets your needs, and that you don’t feel overwhelmed with the volume of food. I’d love to hear back from you how it goes! 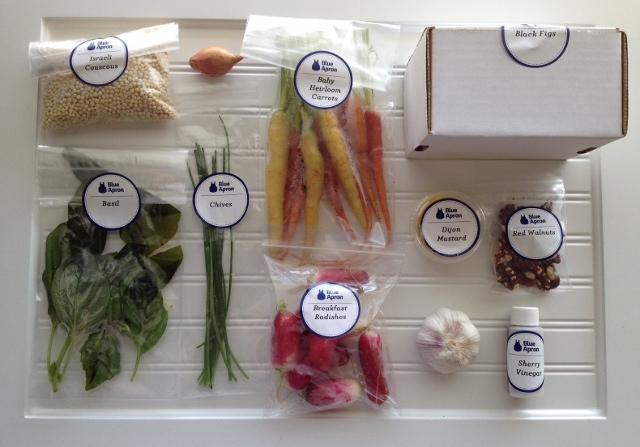 We’ve been getting blue apron for a year now and DID like it a lot, HOWEVER, we noticed, blue apron is lame for non-meat eaters. And today, in our delivery, there was an extra recipe and instruction pamphlet for FRIED CHICKEN!!! The tag line reads, “we know you love chicken breasts…” We couldn’t believe it. This is how I happened on your site; i’m looking for a different option. I wrote to them about this, that they don’t seem to have respect for non-meat eaters (no tofu, etc), and as non-meat eaters, we’re appalled to receive instructions w pics on fried chicken. Hi Sara. I agree, that’s not something a vegetarian wants to find in their dinner box. If you haven’t already found them, I’d recommend Purple Carrot or Green Chef instead!